With nine dining venues, including a buffet that's open nonstop for 20 hours a day from 6 a.m. to 2 a.m., passengers won't go hungry. 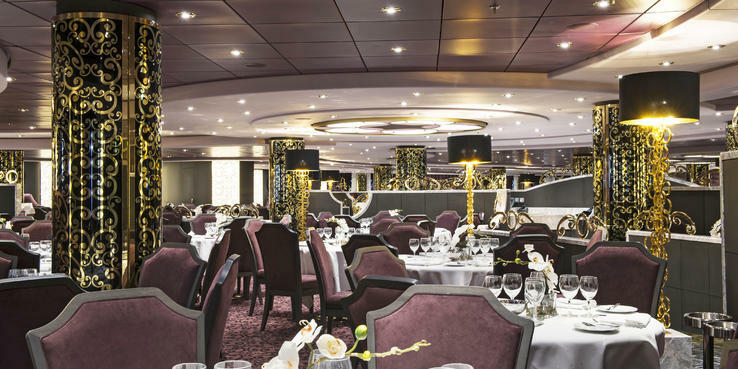 The main restaurants are the two-deck Golden Lobster on Decks 5 and 6, with seating for 1,155, and the panoramic 766-seat L'Arabesque, aft on Deck 6. Both operate two dinner seatings and offer identical menus. Breakfast and lunch are served in the ship's main restaurants and self-serve buffet restaurants, the adjoining Inca and Maya on Deck 14, which offer all-day dining and the option of a more casual setting for dinner. Continental breakfast from room service is delivered free to cabins on request, but there is a charge of €3 ($4) for one dish and €5 ($6.50) for two from the main room-service menu that's available around the clock. In-cabin pizza delivery is also on offer for €7 ($9), which includes a drink. We ate breakfast and lunch in the buffet, which offers a good spread of mainly Mediterranean and fast-food fare, such as pasta, pizza, hot dogs, hamburgers and sandwiches, with a salad bar and smaller stations for ethnic dishes, including curries. Dinner in L'Arabesque, which can be a five- or six-course affair, depending on how many dishes you choose, was rather disappointing. While adequate, the food was not particularly fancy in terms of presentation. Courses seemed rushed, and the wine service was rather haphazard, with waitstaff acknowledging empty glasses but not returning to replenish for some time, if at all. In fairness, this could have been down to teething problems on a new ship with new staff at the start of the season, but there was definitely room for improvement. Similarly, in the buffet restaurant, there was a feeling the team hadn't really gelled. Some staff couldn't have been more helpful, while others barely made eye contact, let alone smiled. We didn't get to sample Eataly, an alternative venue that debuted on Preziosa. MSC has teamed up with the Turin-based chain that champions gourmet Italian food and the leisurely "slow food" movement, which encourages leisurely dining, to open the first two Eataly restaurants at sea. Situated on Deck 7, the minimalist 115-seat Eataly and sophisticated evening-only Ristorante Italia offer a la carte dining, where you pay for every item you order, as opposed to the alternative dining surcharge levied by other cruise lines.